On the last post about a 2002, I was commenting how 2002 prices seem to have moved out of the realm of cheap affordable cars. Well, that just means newer cars are coming in to fill its place. And many people who like cars consider the 1983-91 E30 3-series to fill that gap – compact, relatively light, and sporting. And unlike a 2002, you could get them in various body styles and with various engines: 2-door, convertible, 4-door, wagon (not in the US, sadly) and 4- and 6-cylinder engines. Just like a 2002, the styling was boxy, and the driving experience was key. 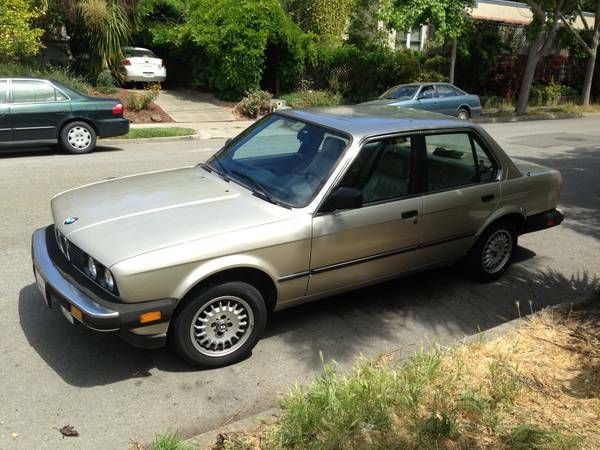 That brings us to the car of the day, a 1985 325e available in Berkeley, CA for $2500. 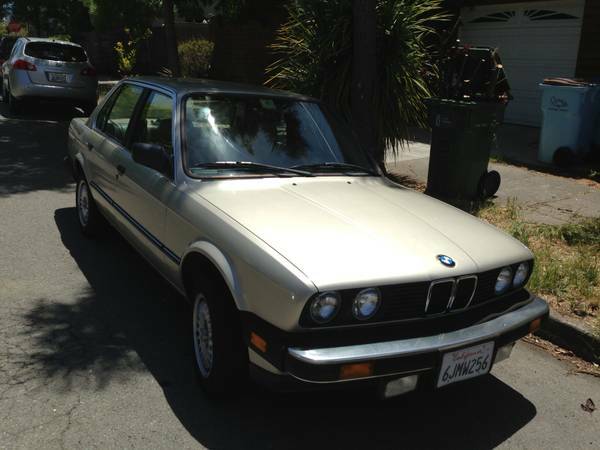 Wow, what a boring color – BMW calls it bronzitbeige metallic, I call it Corolla gold. Nonetheless, the mechanical goodness is still there, and the paint is new and hopefully well-done. The owner doesn’t actually specify what year the car is, but an educated guess based on the lack of a center high-mount brake light (which was required starting in 1986) places this as a 1985 model year car. Expect around 200,000 miles, simply based on the age of the car, and be pleasantly surprised if it’s less. The seller says everything works well, so that bodes well for the condition of the car in general. 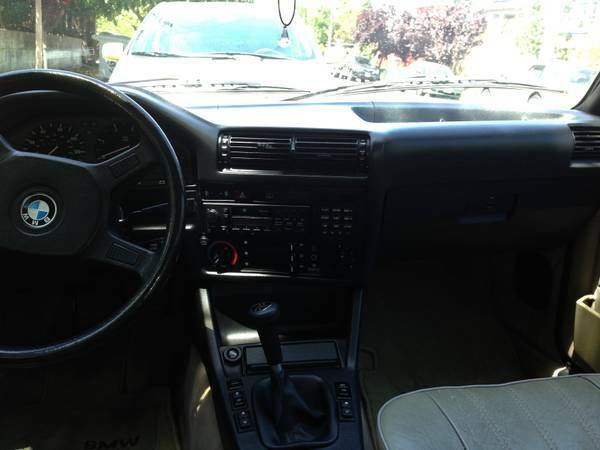 There is also a full service history, and the a/c and heat work perfectly. The car is a daily driver, so you won’t be debugging the car after a long period of storage. And the nice thing about having a 4-door is your friends can easily join the fun. Well, at least for short rides. Finding a sedan with a manual shift is actually remarkable, since most seem to have been sold with automatic transmissions. What little can be seen of the interior is remarkably decent. The car seems well-equipped – a/c, in-car computer, cassette deck and electric windows are all visible. While the steering wheel is a bit shiny, the dash has at least one crack, and the passenger seat seems to be a bit “loose” with age, it’s generally in good shape. This car needs an engine shot to have a totally clear idea of the condition, but overall this looks like one to check out! This entry was posted on June 8, 2013 at 4:58 pm and is filed under Feature. You can follow any responses to this entry through the RSS 2.0 feed. You can leave a response, or trackback from your own site. Complete with Hofmeister kink. Nice.